Today it is our most sincere pleasure and honor to have Jodi Jarvis-Therrian as our guest blogger. Cody and I had the pleasure of connecting with Jodi through author Elizabeth Parker, (Dakota reviewed nearly ALL of her books), and Jodi has recently released HER first book:Furry Philosophy and Memoirs Set in Stone. Jodi also creates exquisite memory stones, which you can read about below. It is our pleasure to introduce you to Jodi Jarvis -Therrian, our new and dear, dear friend!!! Take it away Jodi!!! I would like to thank Caren very much for asking me to guest blog for her! It is quite an honor to be her guest! I believe anyone who has ever loved a pet has felt this way! If only their life span was as long as ours. I think I was put here on this earth to help others who love their pets as much as I do, cope with the loss of their pet and CELEBRATE their lives. With all my heart, I believe that our pets come to this earth to teach us our greatest lessons, and help us through the rough spots.I would like to share some of the wisdom passed on to me by the amazing animals that are present, and from those that have passed through my life, in my book: Furry Philosphy and Memoirs Set in Stone. The wisdom they have shared with me is a true gift I hope to share with you. This wisdom comes in many forms, some of the memories evoke laughter, joy, and yes, even heartbreak, but above all---they convey: unconditional love. I hope these stories will not only brighten your day, but also help those of you that have lost a furry friend. I hope these stories help you to heal, by knowing others feel that same kind of unconditional love, and know that we all understand how hard it is to lose that love. These are stories of not only the lives of furry friends that have affected my life, there are also stories of other precious furry lives from people far and wide. I have included each story in their original form, as they were submitted to me, each very different, special, and unique, like the precious lives they honor. Included are photos showing furry friends, and memories made into loving art, portraying a special story or memory. Some of these animals are still with us in this world and their fur was added to the piece of art work, and some are in the next world, and may have ashes or fur lovingly added inside to honor their special lives with love. I am grateful that I am allowed to do what I love , write and create art to help others celebrate LIFE and honor it!. I think that is what life is all about, taking the gifts we are given, and honoring those gifts by sharing them with others. I take pride in helping people by doing what I love, and creating unique art tailor-made to their specific memories. I love to hear the various stories of the people who contact me, and I would love to hear YOUR stories, and work together one-on-one to create the perfect piece to portray the memories that resonate with you. I can incorporate some fur if your beloved pet is still with us , ashes if they are not. I can make a glass piece from a photo, as shown in some of the photos included above and below. 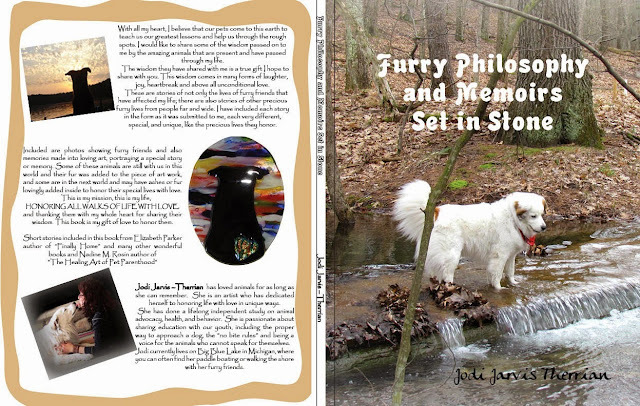 Keep up on some furry fun on my book page on Facebook: Furry Philosophy And Memoirs Set In Stone. "Broken heart rainbow bridge pendant , the heart is to represent the love for our fur friends , the crack is obviously for how it breaks our heart when they go , the rainbow color is to represent the rainbow bridge where we know they will go and be happy and pain free until we see them again"
"The passing of a loved one or a pet can leave such an emptiness . I have unfortunately experienced this emptiness and wish to help others who have too. To help bring peace and keep the loved ones memories close to our heart in a beautiful way, I use a small portion of the loved ones' ashes, hair or fur and fuse them with fine quality glass." GIVE-AWAY!!!! Jodi has generously offered to give ONE READER located anywhere in the world a $50 gift card to be used towards a Basic Pendant on her website, (or to be used towards any other item.) The give-away is open to everyone and all you have to do to enter is leave a comment telling me you wish to be entered. That's it! The give-away is open now and will end on Monday, May 18th at 12 noon EST. The winner will be announced on May 19th. Good luck! Oh Wow dat's weally pawsum. And da fotos be bootyful. Weez wanna enter fur sure. Weez not weady to admit we may be needin' such fingsm but we do wanna enter. And wez sorry to be late, but Happy Mudders day to you. I remember seeing these beautiful memoirs when you posted about them a few months ago. I would love to have one in memory of Pip so please enter me in the contest. This is a special giveaway and whoever wins will be very lucky! you have a good memory! I posted on Dakota's blog either in Feb or March...but....he did not have a give-away!! The give-away was reserved for Cody! It truly is a special give-away and I agree, whoever wins will be VERY lucky! Good luck! I really want to be entered into your giveaway. I would love to wear the pendant it is very pretty and a great memoral to all animals. I don't know if you saw, Caren, but I've been having a very hard time lately - in part due to my grief over Jewel. These pendants are absolutely beautiful, and I would love to be entered into the giveaway. I have a special pendant with Jewel's photo that I wear when I go out in her honor, but I'd love another beautiful one! What a nice giveaway, that broken heart is beautiful. Those hearts are truly wonderful! Those are beautiful memory stones. Thanks for the wonderful giveaway. I wish to be entered for this awesome giveaway. Those are beautiful pendants/memory stones. How wonderful that Jodi has found her calling in life. Good luck with your book Jodi, we hope it sells like wildfire! Jodi is fantastic and such a role model. Thanks for this interview. 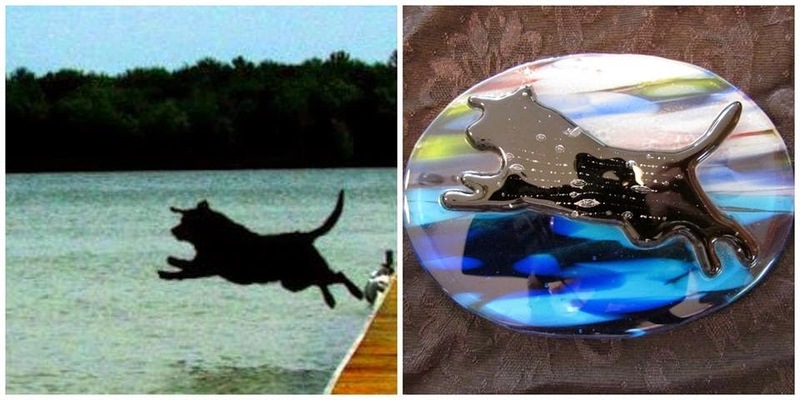 As a dog mom whose beloved Cocker passed away, I would love one of these pendants. I also love the rainbow representation for the LGBT movement. I've seen Jodi's work on Facebook before - it's BEAUTIFUL! I truly enjoyed reading her guest post today. I can't wait to check out her book, and I would be so thrilled to win her giveaway!!! The jewelry is beaautiful. Would love to enter for one of her pieces thank you! This is a lovely giveaway. 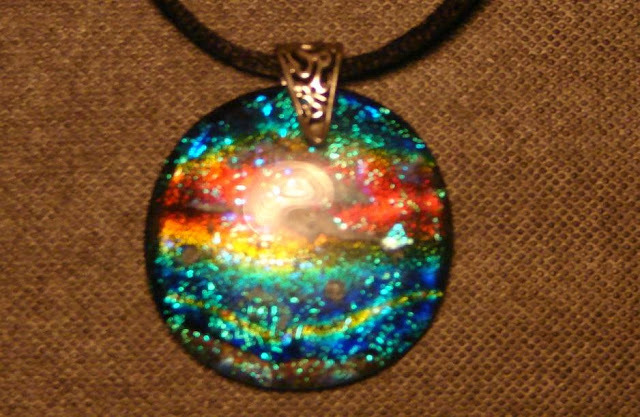 The Rainbow Bridge pendant is just gorgeous and would be a wonderful prize to win. The book looks like it will have a lot of heartwarming stories in it. What gorgeous work! We are going to go right away and have a look at her other work. Thanks for introducing us to her. 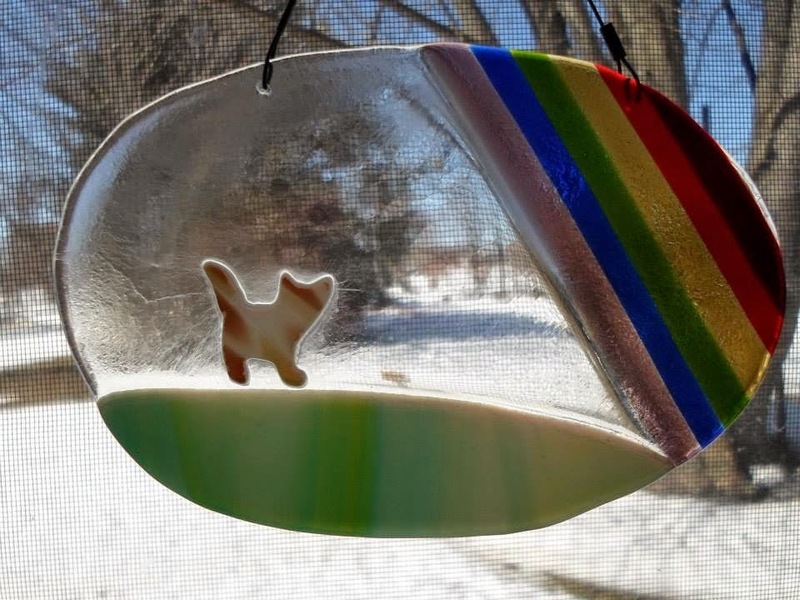 Oh that is absolutely gorgeous and the first photo of a cat with a Rainbow is truly truly moving. Please enter us. What a wonderful and beautiful way to keep our "children" close to our hearts in the form of a remembrance like those beautiful rainbow pendants! Really special........we'd love to be entered. Love the comment Pawesome items heheh! What a great giveaway! I think that we all have had a pet in our lives that would love to memorialize (or one that we want to capture while they are still here). These pendants are beautiful. Please enter me in the giveaway! Love the cat with her "fuzzy" friend, a big Awww! to her. Those last 2 pendants are gorgeous. Aunt Pauline just lost her 15 yr old cat and I bet she’d love one. This would be a beautiful gift for a friend who recently lost her cat -- or maybe for another friend with a beautiful German Shorthaired Pointer. What a beautiful pendant. We would love to win it for the mom. Please enter us. So lovely. I would love one to honor my angel kitty (ies). I have 4 now....Don't have any fur to fuse into glass, though. 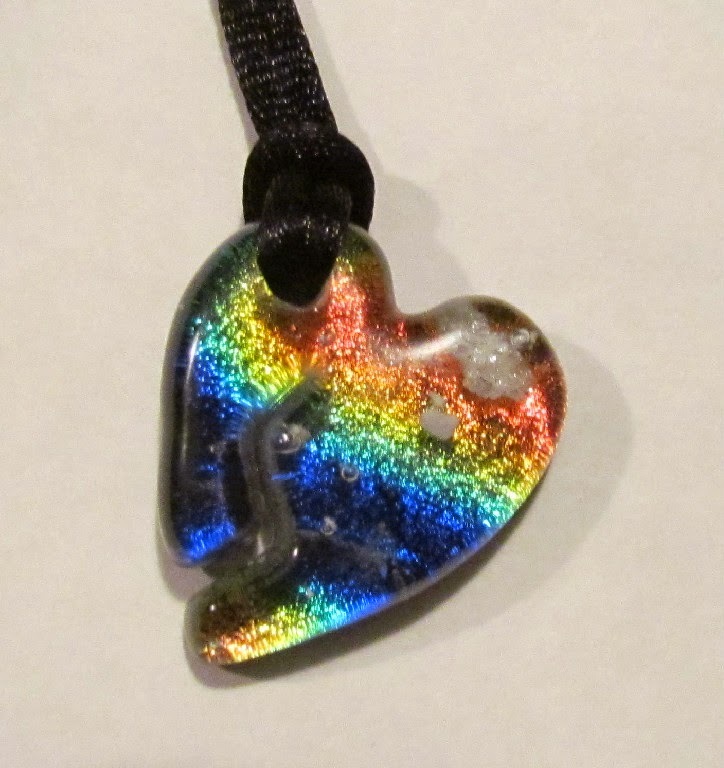 I really like the suncatchers, too. At least I think that;s what they are. Thanks for this, and many thanks to Jodi, too. I remember seeing her posting about this with Dakota. Thanks for introducing Jodi. I'll browse her Amazon shop. So nice to meet someone who really understands the grief we feel when our pets pass and who says it so well through her writing and artwork. Please enter me. I would love to win the pendant. Will check her out on Facebook too..
We do appreciate you stopping by our blog and commenting - Mom promises to get her act in gear and get to blogging and commenting again. She is still blue over losing Lily. I totally understand! You should enter this give-away...if you win it would make a wonderful keepsake to remember Lily. The give-away is open world-wide. If you enter, good luck! We would love to have a chance to win a pendant by Jodi for Mum please.